But cheap? Nah. I’m not really that cheap. I prefer the term “mindful.” You see, I just watch my pennies so I don’t have to worry about my dollars. It’s a mindset I encourage you to adopt, and it can be immensely important in helping you get what you really want out of life. Let’s discuss. For me, adopting the frugal/thrifty lifestyle isn’t about being cheap just for the sake of being cheap. Yeah, it’s fun to find great deals, but cutting my own hair and making mystery stew out of leftovers isn’t my idea of a great time. exercise that doesn’t get you anywhere. Plus, it’s totally unhealthy. In the end, money is only a tool to help you get the things you really want – nothing more. I’ve learned that saying no doesn’t hold me back at all. In fact, it is just the opposite. By controlling my money and watching how I spend it, I’ve actually opened up a whole world of freedom that I never even knew existed…and you can too. It doesn’t happen overnight, but if you practice the little things long enough, eventually you’ll find that the big money issues take care of themselves. And that’s what frugality – thriftiness, being a tightwad, whatever you want to call it – is ultimately about. Freedom. The freedom to make your own choices, to make your own decisions, and the freedom to do the things you really want to do. Controlling your money is all about making choices. More money is nice, but it’s rarely the solution to the problem. Chances are, you already have what you need. You just need to spend it more wisely. Learn to save on the things you don’t really want so that you can spend on the things that really matter. Trust me, it can work for you too. How Can Frugality and Thriftiness Help You? So what are the benefits of taking control of your money? I’m glad you asked. Give yourself a raise. By watching your finances and taking control of the money you have, you’ll effectively give yourself a raise. Seriously, just by creating a budget and sticking to it, you’ll find oodles of money you didn’t even know you had. If you can reduce your expenses, you’ll have even more. Spend on what you value. Most of us spend mindlessly without ever thinking about the consequences. Spending with a purpose focuses your spending on things you really value. By living below your means in some areas, you can afford to live above your means in others. Just think, if all you did was quit spending $10 a day on lunch, you’d save $300 a month. In 5 months, you’d have $1,500. You could use that money to take a vacation, put money in your kids’ college funds, or save for retirement. Now, think if you did that for years at a time. What if you eliminated a few other expenses? Imagine how that could help you achieve your dreams and get the things you really wanted. Retire. I hear a lot of people say that they want to retire early, but their actions don’t suggest they’re serious. If you really want to retire young, you need to get started saving…yesterday. Plus, you need to be saving as much money as you possibly can. There are only 2 ways to do that: 1) Make a ridiculous amount of money or 2) Live on less. To retire at all, you need to start saving and investing at least 10-15% of your income every month. It doesn’t take that much. Just a different mindset than what you may have right now. Remember, it isn’t about how much money you make. It’s about how much you save and spend. Job flexibility. When you’re good with your money, you have more employment options. When you live on less, there aren’t giant car payments and mortgages you can barely afford. Thus, you don’t need to worry about keeping that crummy job that you hate. When you’re not desperate for money, you’re more likely to find a job you really enjoy. Better yet, by having money stashed away, you might be able to launch your own business. It’s called having “F’you money”…and the effects are real! Peace of mind. Are you tired of living paycheck to paycheck? Tired of the financial hiccups that ruin your entire monthly plan? Taking control of your money means you don’t have to worry about the car breaking down or the furnace going out. You’ll have the money stashed in an emergency fund to pay for it. For the vast majority of us, if we simply learn to manage the money we have more effectively, we’ll never have to live paycheck to paycheck again. If you’re in it to win it, it’s time to take action. Get yourself on a budget right away. Don’t know how to do that? Check out our complete guide to creating a budget that actually works. Get on it right away. There’s no time to waste and you’ll thank yourself for it. PreviousDoing My Own Taxes and Saving Big Bucks! “The thing is, I’ve just learned how to tell myself something that a lot of others can’t: No.” It seems to be such a rarity in today’s world to tell oneself no, doesn’t it? I have so been there with money, where I wouldn’t tell myself no, and it created a huge mess. Not going back there again. The discipline is well worth the result. Thanks for this article, I totally agree with you. Is simple as this: Wealth is quiet. Rich is loud. Poor is flashy. My goal is to reach financial freedom by age 25. It’s aggressive, but I’m working hard towards it! I could not agree more Greg. Whatever you want to call it, being frugal is all about freedom. We get comments from time to time from friends or family members and what they don’t realize it’s about having your eye on the long game. The thing is that we really don’t miss what we “had” when we were more free spending because we value freedom and not stuff. You are absolutely right Greg. I’ve been in situations where people would call me cheap for not shelling out money. I call it being practical. I’ve learned to filter out what people say just because it’s not contributing anything to my quest for financial freedom. I am just being reasonable with what I have and don’t have. Being frugal is really about spending money on what you value (freedom, security, experiences, whatever) and when you think about it that way, it seems pretty foolish to do otherwise. You’re absolutely right! Being frugal has nothing to do with being cheap. I see people being cheap all the time and they’re usually the one’s who call out those who are being frugal. There are things like paper towels and manufactured laundry detergent, which I don’t spend money on. I would rather use cloth napkins and make my own detergent which lasts 6 months a batch. It doesn’t make me cheap because I’m able to put more money where it matters most to me. This is the key to financial freedom – simply being mindful of those coins. “Saying no doesn’t hold me back at all. In fact, it is just the opposite. By controlling my money and watching how I spend it, I’ve actually opened up a whole world of freedom that I never even knew existed.” I love this! This is the perfect description of why frugality is awesome! 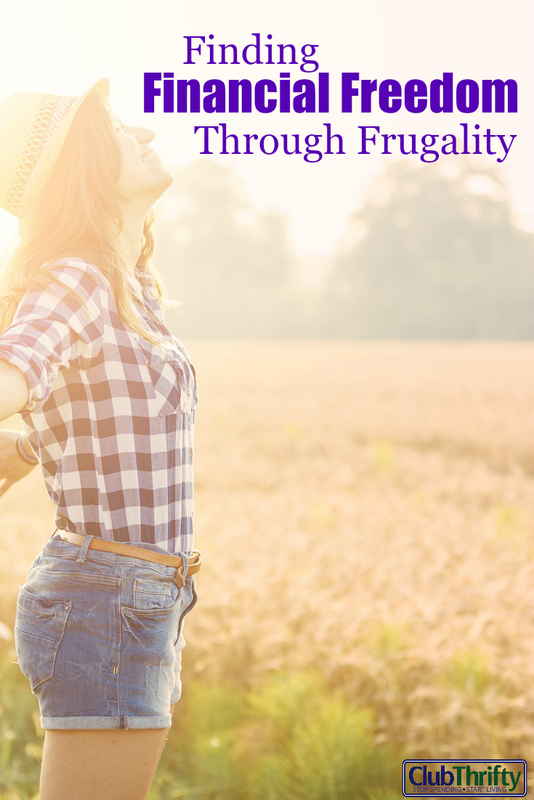 I wish more people would realize that frugality isn’t restrictive – it’s just the opposite.